Though there's nothing new about Sengoku Basara 4 to report, in other areas this has been one of the busiest weeks in recent memory when it comes to news updates! I'll try to summarise everything I've heard over the last few days. It was quietly announced this morning that Sengoku Basara producer Kobayashi 'KobaP' Hiroyuki will be appearing at Capcom's Summer Festival in Huis Ten Bosch event on 4th August 2013. Huis Ten Bosch is a resort near Nagasaki known for its unique anime and game attractions; it's been known for a while that they'd be hosting the Capcom event but up until now there was no Sengoku Basara presence to report on. KobaP will be presenting a talk show and signing mini Sengoku Basara 4 posters for the fifty lucky fans who win the chance to attend via lottery. Artist Tsutsumi Yoshisada confirmed this week that the new Sengoku Basara 3 x Kodansha BOX novel will be penned by Kagami Seiji. 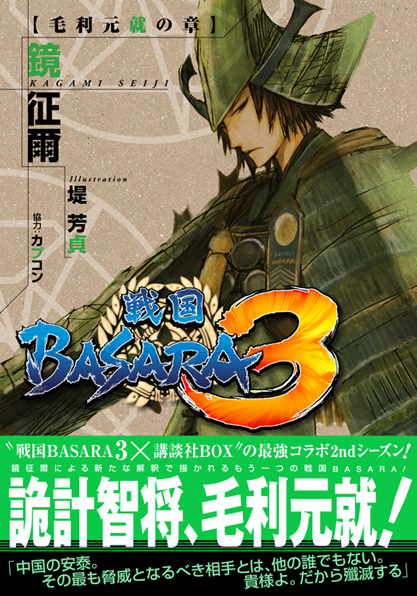 It's planned for release on 30th July 2013, and as previously advertised the title will be Sengoku Basara 3: Mouri Motonari No Shou ('Mouri Motonari Chapter'). This will be the second book in the current 'season' of the novel adaptations, and the sixth overall created for the Kodansha BOX project. The official website for Butai Sengoku Basara 3 Utage Two (Kyouou Tanjou x Shinen No Utage) has been updated today to announce three new cast members. 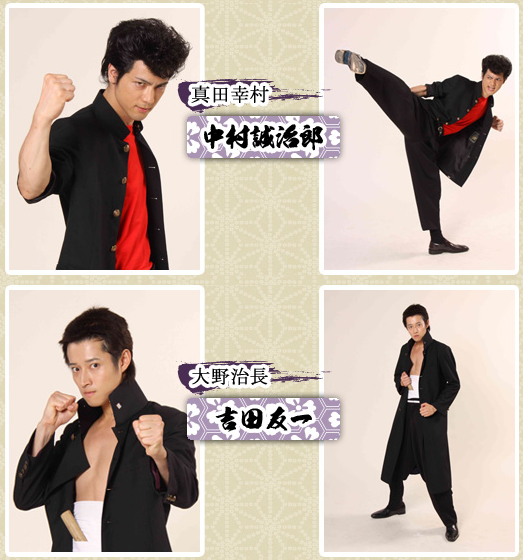 Joining the roster from my previous post will be Takenaka Hanbee (Kawasumi Bishin), Houjou Ujimasa (Yamamoto Kenji) and Itsuki (Sakai Ran). Hanbee has been recast with a brand new actor while Ujimasa and Itsuki have never appeared in the stage play series before. It's a relief to see that Hideyoshi isn't being separated from his loyal companion after all; I'd been starting to worry! Although I previously reported the news that the DVD recording of Butai Sengoku Basara 3 Utage would be available in late September 2013, the official website has now announced that the release date has changed to 31st August 2013. That's a whole month earlier than expected! The special edition has long been sold out in Japan leaving only the ¥6,000 standard edition available directly from the Dais Shop. The listings have also gone up on more foreigner-friendly websites this week: although Amiami is sold out of the special edition, Yesasia still seem to think they can get hold of it. 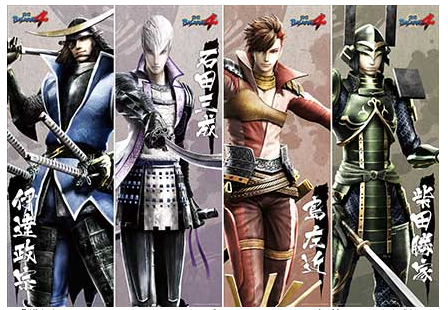 Fans of new Sengoku Basara 4 characters Shima Sakon and Shibata Katsuie might be pleased to learn that e-Capcom is now selling the set of special stick posters released at the Butai Sengoku Basara Bushou Matsuri event. There will be a limited number of sets available so eager fans are advised to place their orders quickly. The whole album can be purchased on iTunes for a bargain price of ¥1,500. I'm going to resist until I can see the show for myself; hopefully a CD will be announced by then as a physical copy would be even better. Remember the Sengoku Basara Tougun BEST (Sengoku Basara Eastern Army BEST) and Sengoku Basara Seigun BEST (Sengoku Basara Western Army BEST) soundtrack CDs which came out back in April? Japanese website Inside Games suddenly decided to post a review of them both this week. If you've never played any of the Sengoku Basara mobile games, the sample pictures might be of interest - and the CDs are good too, of course. Between 26th July and 31st August, the main Animate store in Ikebukuro is hosting a special Sengoku Basara merchandise area to promote the new Mame Sengoku Basara goods (decorative card jackets, mugs, bookmarks and mouse pads). Customers who spend over ¥1,000 on Sengoku Basara items during the promotion period will receive an exclusive Mame Sengoku Basara card with their purchase. There are four randomly-selected cards to collect. Although Sengoku Nabe TV did once feature at Basara Matsuri, this next story has very little to do with Sengoku Basara itself; it's probably only of interest to fans of the stage play actors. It seems that actors Yoshida Tomokazu (Katakura Kojuurou) and Nakamura Seijirou (Ishida Mitsunari) once appeared in the historically-themed variety show's recurring Osaka Highschool: Koukou Yotarou Bakushin Road skit. The skit reimagined the famous historical Osaka campaigns as battles between a bunch of stereotypical high school thugs. Yoshida played Oono Harunaga while Nakamura had the coveted role of Sanada Yukimura. The reason that this has come up is that the episodes in question are being re-broadcast at the moment in Japan and of course, the actors are now much more well-known amongst Sengoku Basara fans than they were at the time. I'd seen some of the skits myself without ever making the connection! While I'm on the subject of the stage play actors appearing in unexpected places, the last piece of news for today is that the stage play's original Date Masamune, Kubota Yuuki, will have a major role in the new Kamen Rider Gaim tokusatsu series. There's going to be a samurai theme to the show so Twitter is ablaze with remarks about the auspicious casting decision. There sure is an overwhelming amount of Basara-related things that keep coming out! Oh my! But well guess who ended up pre-ordering that Utage stage play DVD. I'm really looking forward to see real people pretending to be awesome video game characters. *laughs* Seriously I am! Hope it's good!! I'd love to hear what you think when our copies arrive! Anime/game/nerd stuff = so much fun, but so expensive. I hope you get some money over to save too.